Idan Tal is a professional soccer player. 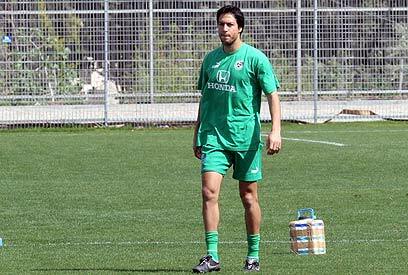 He is 30 years-old, and was born in Beer-Sheva. He started playing soccer at age 11 in Hapoel Jeursalem. Then he went on to play for Maccabi Petach-Tikva, Hapoel Tel-Aviv, Spanish Merida, British Everton and Maccabi Haifa. Next month he will join Bolton in the UK. He is married to Doreen, a communications student, and has two children: Miron (4) and Amit (3). He lives in Haifa. ...You asked yourself "in which team did I have the most fun?" I keep checking with myself all the time, and it's clear that I had the most fun at Maccabi Haifa, and not just because of the success in soccer: I had also succeeded socially. We have lots of friends in Haifa, and we are very attached to the city. Doreen and I ask ourselves where we will live upon our return from Britain. We have family and friends in Jerusalem, but we love Haifa. ...You compared Israel to other countries? I do not make comparisons, because it's a completely different world. Without offending Israeli soccer, European soccer is much better. In order for us to be en par with Europe, a transformation must be made, and not necessarily with regard to the money the players earn: I am talking about better facilities and better stadiums. I also think that everything starts with what goes on in a player's mind, if he knows that he will have to work hard all year, at every practice, and if he constantly thinks how to advance, then eventually he will improve. I lived abroad for three and half years, and had a great time, especially in Britaim. I love British culture and etiquette. In this regard, we still have a lot to learn. When I returned to Israel I felt that I was supposedly regressing, but apparently God loves me, and now he is giving me a second chance. 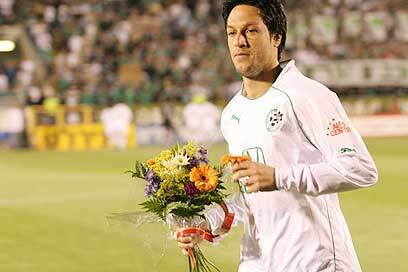 I know that there has never been an Israeli soccer player who left to play abroad at my age. ...You wished for your children to become soccer players? I would not want them to become soccer players. It's a very difficult profession, and one has to work at it with lot of 'elbowing', unfortunately, but they are very aware of what I do for a living: When my kids walk with me down the street, they see that people ask me for autographs, and sometimes they come with me to the matches. I took them to the last championship match, because it was a celebration and I wanted them to have fun. At home, we have a big garden and they play there, but not only soccer. They like to paint and play with building blocks. I am constantly fulfilling a dream by having a family and children. It is fun for me to be with the kids, especially now, during the off-season. I wait for it all year long, because throughout the season I have all kinds of pressures on me, and sometimes I'm not completely in focus when I'm with the kids. During the off-season, I have some peace of mind, and I do whatever makes them happy: Take them to a ranch, take them to play computer games, talk to them, do stuff that kids like to do. I am a great dad ? let everyone take notes. You consulted with a Rabbi? When I first arrived at Haifa, I was introduced to Rabbi David Abuhatzeira from Qiryat Eliezer. He is a man of great stature, and the way in which he thinks and acts charmed me. Since then, I have consulted with him on a number of personal matters. Because of him, I have grown closer to religion, and even began to put on the Tefilin every day. He did not push me to do that, but he spoke with me about this issue and its importance, and I figured it will only be good for the soul. I cannot keep the Sabbath because of the matches, but on Friday nights I don't leave the house. If I wasn't a soccer player, I may have been a man of religion by now. I do not count out this possibility in the future. ...You wondered what you will do after soccer is done with? I do not think about it. I want to enjoy what is happening to me right now without thinking too much ahead, although I know that a soccer player has a short career. Apart from soccer, I like the stock exchange and foreign currency. I delve in it quite a bit with my broker's assistance. At the moment things are not doing great on that front, because there having been some currency drops. I try not to lose money. I am also very interested in bonds and real estate. At the beginning of the season when we played against Malmo, at the Champion's League qualifiers. If we would have won, we would have advanced one more stage, but it slipped between our hands for the second time in a row and I couldn't take it anymore. It hurt me. Sometimes I cry when I leave for the training camp and bid my family farewell. It's not real crying, but I am very sad inside. ...You rejected a tempting financial offer? Three seasons ago, when I returned from Spain. I had two offers back then, one from Maccabi Haifa and one from Beitar Jerusalem. Beitar offered a lot more money, but at the time there were professional issues there, and I did not want to take a chance. I said to myself: "I will make less money, and go to an orderly place." In hindsight, I realize that was an excellent choice that other players might not have made, because money is a very tempting thing. I also had offers to model, but I didn't want to deal with that because that is not who I am. ...You had a girlfriend who was a model? Never. I don't relate to that, and I am not interested in it. I have been with my wife for ten years: She is a top model; she is a great friend; she is a wonderful professional media person; she has everything that should be in a woman. I have never taken advantage of my status and the publicity to get to know women. I wouldn't even go out much to discos: I prefer the staying at home, watching movies and reading good books, especially about economics, which is what interests me. But, I did meet my wife at the "Hauman 17" club in Jerusalem. When I was a kid, I would go out there once in a while. I saw her, I was enchanted and my heart was broken. ...You felt that your career takes too great a toll on you? Sometimes I am too concentrated on myself and not about my family: I come home tired from practice, and need to rest at least two hours, and sometimes that bears on family time. But I am happy when that happens at noontime, when the kids are in kindergarten. In the evenings, I try to be with them. ...You asked yourself: "How will I raise my kids in England?" I think about that it quite a bit recently, but I look on the positive side: They will be exposed to new things, to language, to culture, and that will widen their horizons. I worry more about my wife, because while I will play soccer, she will be alone at home and that is very hard. I feel guilty because of that. Luckily for her, she is studying at the Open University, and can continue to study there too, which would pass the time somehow. ...You did something for someone else? During Passover, I went with the team to a department of children stricken with cancer at Rambam Hospital. It was very hard for me to see sick children, and it puts all kinds of thoughts in your mind that I try to brush off, but such is life, and in life one must see everything, not only that which is beautiful. I also privately visit sick fans. This is, in my opinion, the happiest thing this profession offers, and it gives the best feeling: The fans make me happy during the game and cheer for me for 90 minutes, so if someone has some sort of problem and has difficulties, why shouldn't I return the favor in my own way? I meet with them, talk to them and give them an autograph. For them that is a grand thing. That's the best part about soccer: Making people happy. Two weeks ago, I flew on a private jet for the first time. A famous businessman took me on his plane to the Champion's League final in Paris, and it was amazing. There were all the accessories in the world: Extremely fancy armchairs, amazing stereo system, great food, and nice pilots who explain the route. I had fun. I felt like I was loved. See all talkbacks "Idan Tal: Israeli success in British soccer"